I've been using this product on my legs as i get bad bumps on my legs after shaving and it has helped keep them to a minimum although i struggle to get into a routine and use regularly as the smell isn't my favourite which does sometimes put me off using it. However I am impressed with the results when i do use it on a more regular basis. I've also found this is quite good at getting rid of stubborn ingrowing hairs which i also suffer from which is an added bonus! I have ceratosis at the back of my arms, which is quite hard to smooth out. I don’t like using crubs, so this lotion type of product is my ideal solution: it has a rich texture, which dries out on the skin almost immediately, but it doesn’t dry the skin at all! Moreover, if used regularly, you will see the results in literally 7-10 days! I’m impressed how smooth my skin is becoming now, and I’m looking forward to my ceratosis to disappear completely with the help of this lotion. 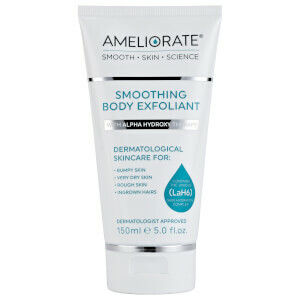 I will be trying the shower products from Ameliorate now too. The body lotion is fantastic. It has made such a difference to my skin. Marvellous cream. Would recommend it to anybody. First tried in the summer after receiving a sample in a beauty gift and now a convert! Does everything it says and more, my skin is so soft and the fragrance is lovely. Bought for my daughter as she suffers with bumpy skin on the top of her arms. She says it’s good. I'm not usually one to leave a review, in fact this is my first but I wanted to share how impressed I am with this product. I've had red bumps on the backs of my arms all my life and tried every product imageinable to deal with it but this is the only one that has actually worked. Very impressed and would highly recommend.